Ever since I got pregnant with the Munchkin I've developed allergies. This year is no different and if anything, is the worst year to date. I'm constantly stuffed up, I get headaches due to nasal pain, and my eyes...oh my eyes! They get so beyond watery that lately I feel like I'm under water 90% of the time (I just had a mental image of Homer singing "Under the Sea"). It's annoying! I've become one of those old ladies who have a constant wad of Kleenex in their pockets and purse, and who, not-so-secretly, shove fistfuls of tissue in my pockets whenever I come across a box of tissue or roll of toilet paper. A word to the wise: don't go rooting through my pockets...you're not going to like what you find!! So anyhoo, eons ago I discovered a vicious cycle about myself: my eyes water, I dab away at them with a tissue, said tissue leaves little white particles around my eyes, which then irritates them even more, which then makes my eyes water on top of the allergies...like I said, vicious cycle. It doesn't matter what brand or kind of tissue I use either, parts of it will still disintegrate enough to leave little bits of it in and around my eyes. You know that Charmin commercial with the animated bears and how they get toilet paper stuck to their butts? Yeah, that's what's going on here. But with my eyes. Not fun and it ain't pretty. We won't even talk about the white dust it leaves in the pockets of a black jacket. Did I mention that I go through boxes and boxes of this stuff? Yeah, I do. I can only imagine what my carbon footprint is based solely off of facial tissue. Needless to say for months I've been thinking of ways to remedy this situation. The solution: handkerchiefs. I thought long and hard about them. Would I actually use them? Would I get grossed out after each use? Would I remember to wash them frequently? Every store I go into I would take a gander and see what they had in terms of handkerchiefs and would always end up...disappointed. Store bought handkerchiefs are either really manly, really sterile looking, or really gangsta. Yes, I know, who's going to be looking at my handkerchief? Better yet, who would be judging me by my choice of handkerchief? Still...everything I saw just wasn't...me. Just wasn't my style, and one of my mottos is "in everything you do, do it with style". 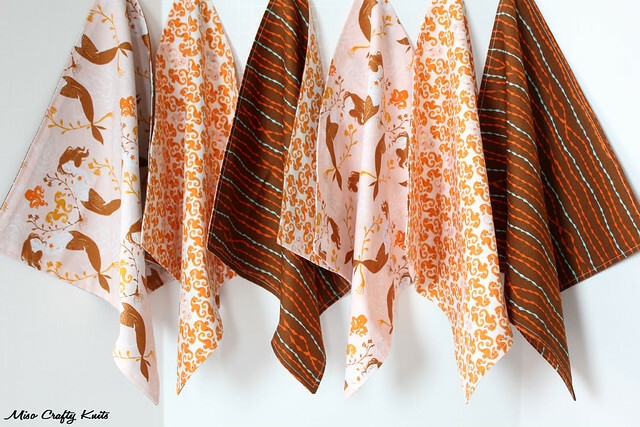 A prime example - Stephanie Dosen of Tiny Owl Knits (she's the one that designed the Beekeeper's Quilt). Stephanie has this whimsical, ethereal, woodland fairy thing going on and it seeps into everything she touches and does. It's in the way she dresses, how she decorates her house, the things she designs, heck, you can even sense it in how she types (if you ever read her posts on her Ravelry group...then check out her videos, she types like she talks)!! Even Martha Stewart fits the bill. Everything about her screams timeless classics with a lot of order. And Robin's Egg blue. These handkerchiefs are super basic. I had cut out 12x12 inch squares, sewn them wrong sides together whilst leaving a hole so that I could flip them right side out, pressed, and topstitched around. Easy peasy! I heart them so much!! I'm so über pleased with how these turned out. I know, they are so simple how could I mess them up? I was just worried that they would look...I don't know...weird? 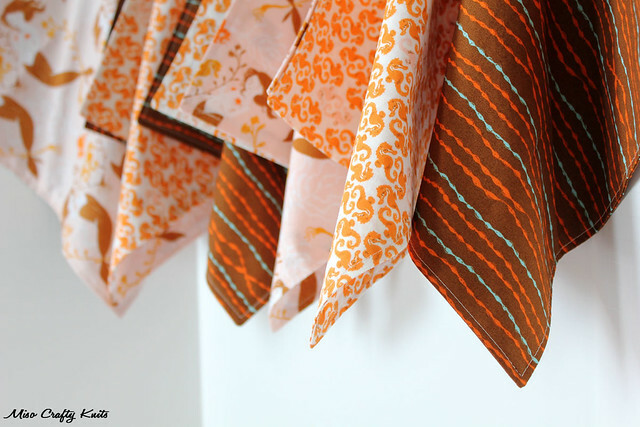 I only made six handkerchiefs to start out with, just to see if I even like using them. I have to admit that I kinda don't want to use them because I think they are so lovely. I have been sporting one around with me (the seahorses) and so far so good! 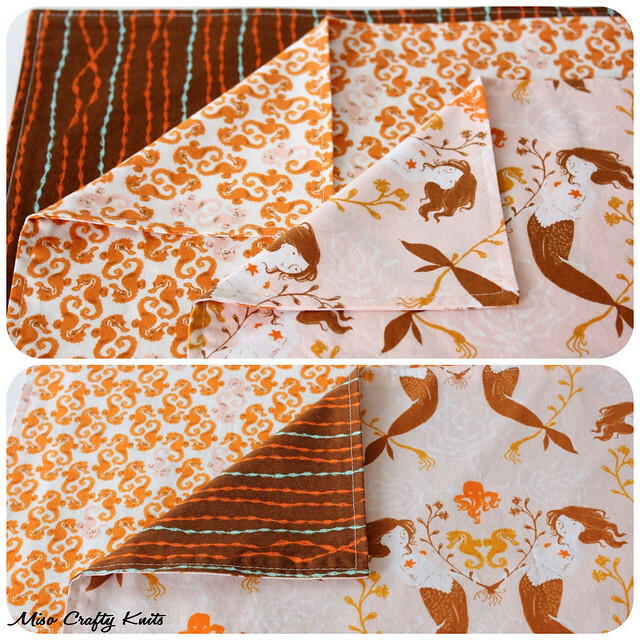 All of the handkerchiefs are reversible (hence the double sided), three of them are of the same print as the other side, and the other three are different. The Munchkin is currently sick with cold and although his runny nose is no longer faucet-like, he still gets the sniffles. A few of the handkerchiefs are boyish enough for him to use without him having to roll his eyes at me (cause trust me, even at three the kid has developed the attitude where Mom's actions are sometimes questionable. At three!). Can I also take a second here to show you something I'm über proud of? Check out the corners of these bad boys. So nice and sharp. Yeah, a few of them aren't so much that pointy but you can't win them all. I'm still pretty darn proud. So proud that I had to take a photo and text it to Brett. Then I put them away to finish later Tuesday night. When I pulled them out again I saw the corners and ran to show Brett. He was less than impressed. Maybe because I woke him up to show him? Nah. So I tweeted about it. Total geekery. But whatevs. It's the simple things, right? I would LOVE to get my hands on some more prints from this collection. 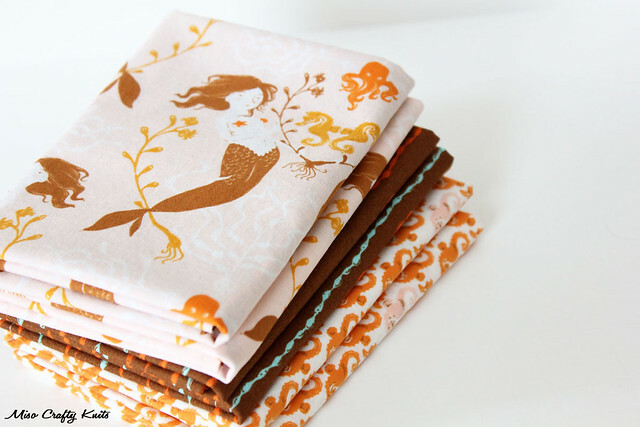 There's another print of mermaids swimming with octopi (in fuchsia too!!) that makes my heart beat oh so fast, and an octopi print that I think is absolutely adorable. My favourite out of the entire collection is the twin mermaids. Just.so.lovely! They make my heart squee! These are an early Mother's Day present to myself. 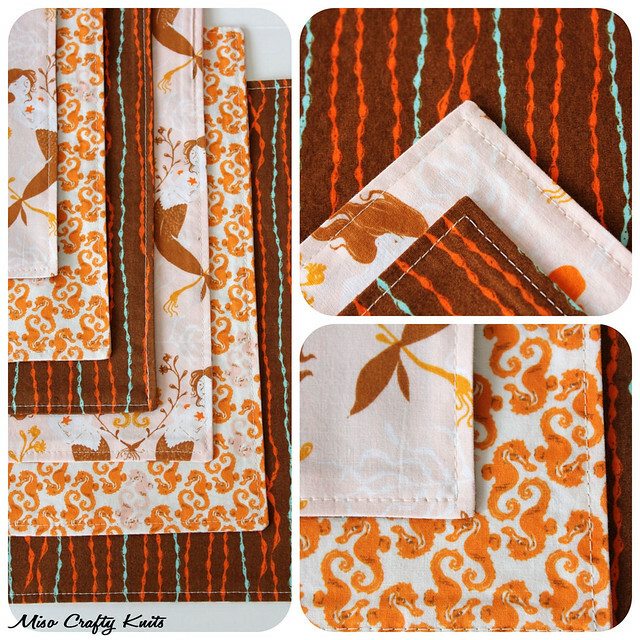 If my Mom used handkerchiefs, I'd make her a set too, but she didn't seem so keen on the idea. Oh well. Ok, enough with the handkerchiefs. I'm sure you've had your fill of them. So I'm off to enjoy one more cup of coffee and then play some Lego with the Munchkin. 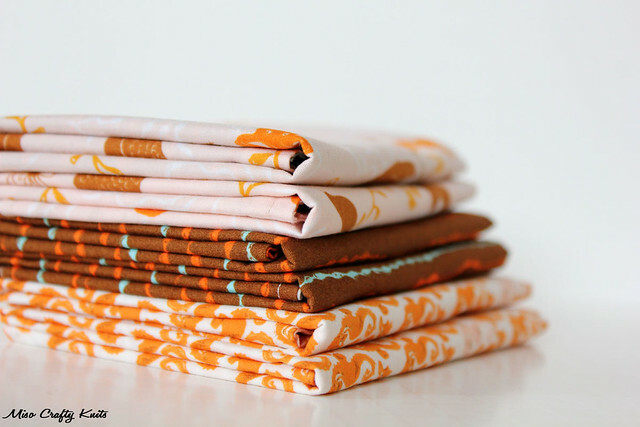 And maybe pet my stack of new handkerchiefs! Thanks Nat!! 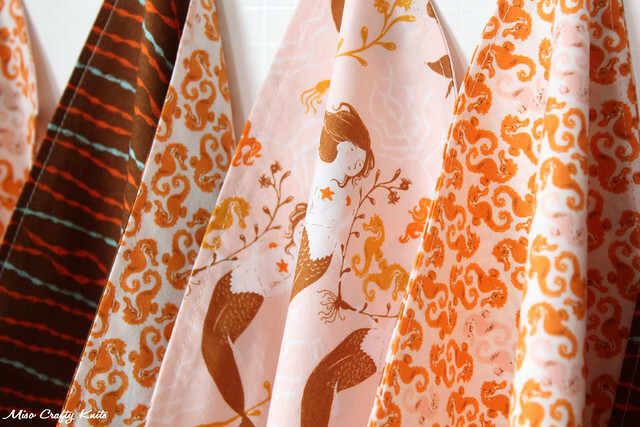 I absolutely love this collection of prints...so nice and girly without it being too in your face! 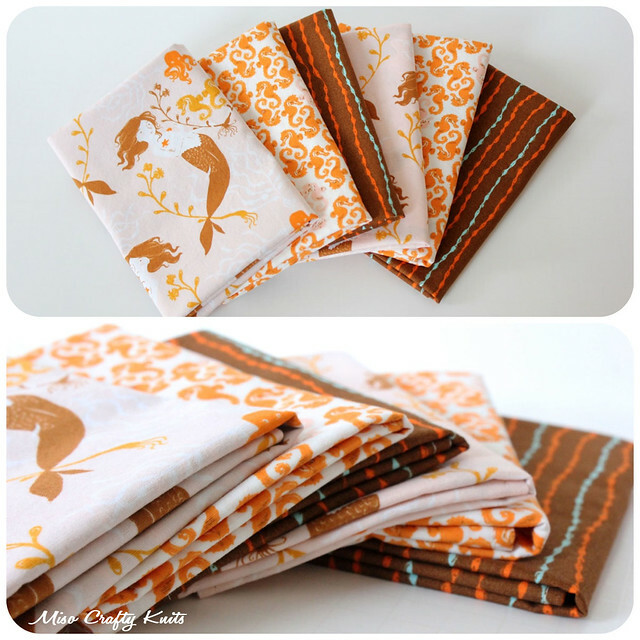 I'm thinking I need to use up what I have left of these prints and make more handkerchiefs! You should definitely make some! They are easy peasy, I promise!! I had the same problem too with tissues in the laundry. No matter how many times I go through all my pockets, I still always manage to miss that one lonely tissue and don't realize it until after the wash cycle when I see little bits of white all over the clothes! Doh! So amazingly gorgeous! You are gonna bring handkerchiefs back singlehandedly they are so cool! Great work! Thanks Lynnette!! 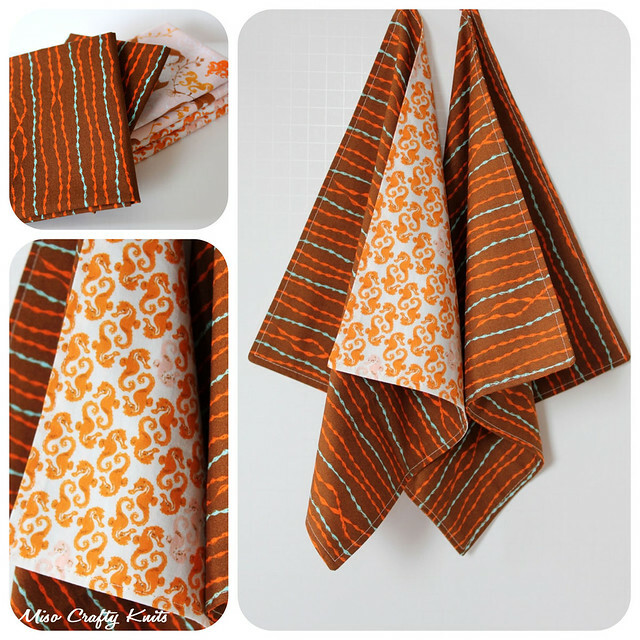 :) I was hoping someone other than me liked these handkerchiefs!